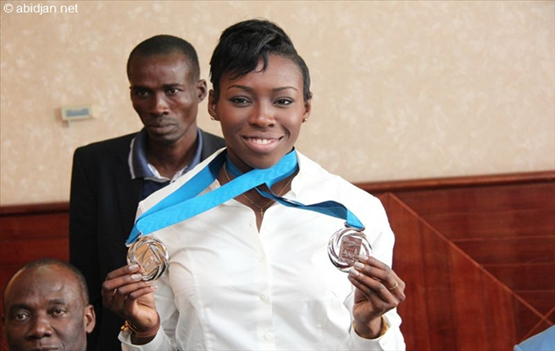 « I encourage the African Youth to work harder… Because nothing is impossible », said the Double silver medallist at the 2013 world championships in Moscow (100 m and 200m). Indeed, nothing predestined her to do sport. Murielle Ahouré is the proof that you can start with nothing and realize your dreams. Ahouré is an Ivorian sprinter who specializes in the 100 and 200 metres. She was a double silver medallist at the 2013 world championships in Moscow. She came second in both the 100 and 200 meters at this event. Born 23 August 1987 in Abidjan, economic capital of Côte d’Ivoire, Ahouré moved to France at the age of two and lived there till she was twelve. Due to the nature of her adoptive father, Mathias Doue’s Job (Chief of the Defence Staff of Côte d’Ivoire, 2000-2004), she travelled to the United States for more protection. Ahouré fell in love with athletics at the age of 17 in the University. She participated in the competition in United States where she got good performance. She was the 2009 NCAA Indoor Champion in 200 metres while running for the University of Miami. She finished first in 22.78 (her personal best in 200m). In spite of the good performances, she was unable to compete abroad because she was illegal immigrant in USA. But, in 2012, the President of Republic of Côte D’Ivoire, Alassane Ouattara, she got her identity papers and sprang to the international scene in March 2012, she came second (7, 04) in the 60 metres at the 2012 IAAF World indoor Championships in Istanbul, Turkey. She ran under seven seconds for the 60 metres in February 2013, becoming the seventh fastest woman ever with her time of 6.99 seconds. Ahouré holds Ivorian record in 100 metres outdoor and African record in 200 metres indoor and outdoor. At the 2012 Summer Olympics she placed sixth in the 200 metres and seventh in the 100 metres. She is now popular in her Country and all little girls in Ivory Coast wants to be one day like her. “When I won world indoor silver in Istanbul I returned to the Ivory Coast and I couldn’t believe my eyes as there was a huge crowd to greet me at the airport. It was crazy”, she says.